The Los Angeles city council voted to reinvent the wheel on Friday. 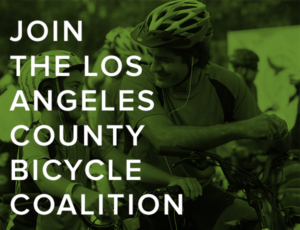 Despite several free, nationwide bike registry programs — including Bike Index, which this site links to — the council voted to explore creating its own registry program. Never mind that the cost of administering such a program would likely exceed the amount it would bring in. Or that the city council cancelled LA’s existing bike registry nearly ten years ago after it was almost universally ignored, and nearly impossible to use. And that police officers too often used it as an excuse to pull over and search bike riders of color. Then there’s the problem that all thieves had to do to escape discovery was take stolen bikes to one of the 87 other communities in LA County, where the LA bike registry wasn’t used. What’s really needed is voluntary, countywide — if not statewide — registry. 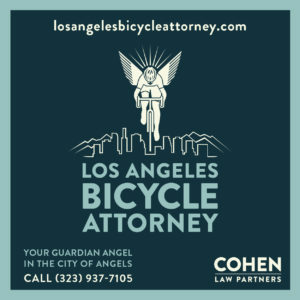 Until that happens, Los Angeles is a lot better off partnering with one of the existing free bike registries. And promoting the hell out of it. Full disclosure: Neither this site, or I personally, receive any compensation for hosting the Bike Index bike registration program here. I just effing hate bike thieves, and want every stolen bike to find its way back home. A road raging Denver driver fatally shot a 13 year old boy, and injured three other members of the boy’s family after following them to a parking lot and briefly arguing with the boy’s mother. Then told police he has mental health issues after admitting to the shooting. So why was he allowed to own a gun — let alone drive a car? And commenters fall over themselves congratulating an Indiana state trooper after he tweets about ticketing a driver for not speeding in the left lane. Thanks to Chris Klibowitz for the heads-up. Powerful piece from a Toronto columnist, who says we know how to make roads safer, we just have to do it. He writes that New York eliminated fatalities on Queens Blvd, aka the notorious Boulevard of Death, where 186 people were killed between 1990 and 2014. How did they do it? As summarized by the Times, they narrowed and removed some car traffic lanes, and decreased speed limits by five miles per hour. They increased the amount of time given to pedestrians to cross the street and increased the number of pedestrian crossings. They redesigned sidewalks at intersections to narrow the crossing in some places. They introduced bike lanes and larger medians protected by barriers to the road. They added cameras with photo radar near schools. If you want to make roads safer, you can. How to do it is not a mystery. Slow traffic down through laws, enforcement and — especially, crucially — design improvements. Put infrastructure on the street to protect cyclists and pedestrians. Pay close attention to intersection design. Voila. He goes on to add that Stockholm, Sweden, the birthplace of Vision Zero, has a fatality rate just one third of New York or Toronto. Lower speeds, better protections, designs that discourage collisions and encourage safety. Maybe some day, Los Angeles will care enough, too. Organizers of a British triathlon threaten to permanently ban racers who were responsible of undertaking a woman riding a horse on a trail, crashing into the side of the horse in their rush to pass unsafely. And yes, both the horse and its rider were wearing hi-viz. Seriously, it takes a special kind of schmuck to pull something like this on a public right-of-way, race or not. 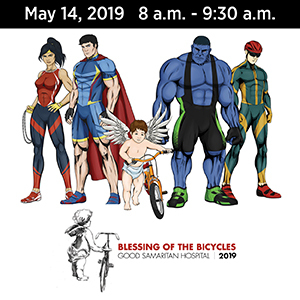 Metro is teaming with the Mid City West Neighborhood Council to offer a free class on how to ride safely on city streets; participants will also receive a free helmet and bike lights. The executive director of Los Angeles Walks calls for dedicating one or two parking spaces per block for shared bikes and scooters, rather than parking them on sidewalks. Yo! Venice reports bike theft is on the rise in the seaside community, which is already one of the city’s hotspots for bike theft. And recommends registering your bike to help get it back if it’s stolen. 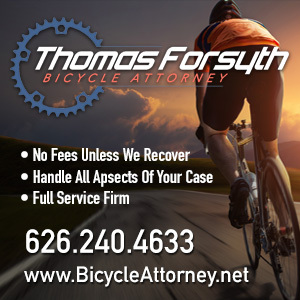 A Fresno bike shop’s troubled spring took a turn for the worse when one of their customers collapsed and died on one of the store’s group rides; a fundraising page has raised over $1,700 of the $2,500 goal for his family. A San Francisco bike rider is suing the city and county, as well as a construction company, after she broke her wrist falling on debris in a construction zone. Caltrans will widen shoulders and install bike turnouts along Highway 1 in Marin County to improve bike safety, as well as installing “mumble” strips along the center line, which are quieter than rumble strips. GeekWire tries out one of Uber’s Jump dockless bikeshare ebikes as they begin moving into Seattle. The bikes are already available in the Bay Area, but haven’t begun a southward migration yet. A retired Kentucky journalist discovers that he lives just off a US bike route, and stumbles onto a cross-country Bike MS ride. Milwaukee bike advocates have declared 100 Days of Biking to celebrate the trails, rides, events and people that make the region special. An eight-year old New York program extends the joy of bicycling to people with visual or physical disabilities by pairing them with a partner on a tandem bike. Despite needing a number of improvements, bicycle traffic often exceeds motor vehicle traffic during rush hour on New York’s Chrystie Street, where a protected bike lane was installed two years ago. A stuntman offers advice on how to crash your bike while keeping your body and dignity mostly intact. I offer my own hard-earned lessons on how to crash on the Survival Tactics page above. A Vancouver TV station says ebikes are revolutionizing people’s commutes. While Vancouver residents prepared to celebrate a pair of Car Free Day open streets events, a local TV station can only see through the prism of their own windshield bias, warning of a traffic hell for motorists. Saying “this is why we can’t have nice things,” organizers threaten to pull the plug on a popular Windsor, Ontario bike ride because of the behavior of a handful of riders. The Montreal Gazette examines how to coax commuters out of their cars and onto bikes. Toronto condo owners are being warned not to trust locked bike rooms in their buildings, which are being targeted by thieves. Which is fair warning for bike riders anywhere — don’t trust bike rooms or garages without extra security of your own. A 13-year old boy was arrested in the death of a Toronto bike rider who was intentionally run down, then kicked, beaten and stabbed by the occupants of the car. A UK bike rider says the country’s mental health services have failed him, as he’s suffered from PTSD after finding the body of a suicide victim while biking to work two years ago. A British reporter discovers first hand the abuse and harassment women on bikes experience on a daily basis. A researcher calls for a mandatory helmet law in Norway, after a meta-analysis shows helmets reduce the risk of head injuries by 60%. Even though the experience in other countries shows that helmet laws reduce the injury rate by reducing the number of people riding. A riot broke out at an Eritrean cycling festival after opponents of the country’s president barged in throwing bottles, food and beer kegs; nine people were injured, including children. Another ride to add to your bike bucket list — experiencing the unique biology of Madagascar by bike. And as long as you have your bucket list out, here’s eight more epic cycling tours around the world. In a major turnaround, two-thirds of Aukland, New Zealand residents now believe bike lanes are good for the city and would welcome them in their own communities. This should be a lesson for Los Angeles; the opposition to bike lanes disappeared as more were built and people began using them. An Aussie columnist says it’s time to end the bad blood between drivers and people on two wheels. Funny how it’s only the ones who ride bikes who call for a truce on the streets; it’s almost as if most drivers don’t even know there’s a problem. Caught on video: A Perth, Australia bicyclist was lucky to escape with a case of ‘roo road rash after becoming the latest victim of a jay-jumping kangaroo. A Japanese newspaper says the best way to explore Okinawa is on two wheels. Seoul, Korea was expecting 5,000 bicyclists for a 13-mile annual bike parade on Saturday. A Scottish cyclist broke the 97-year old hour British hour record — on a Penny Farthing. Now your bike can have its own little house, just like the dog. If you’re going to ride on the freeway, at least take the lane. And I’d be pretty pissed if bike riders whizzed near me, too.